Doll’s house and contents, acrylic/ synthetic resin/ mixed media, designed and made by Frans and Christina Bosdyk Sydney, New South Wales, Australia, 2006. The dollhouse made from wood, acrylic and metal. The sides and back enclosed with a clear acrylic front door. It features five levels connected by a central stair case. The first level is fitted with a kitchen and living room, the second with a bedroom and study, the third with a bathroom and bedrooms, the fourth with bedrooms and the attic with linen storage, activities rooms. Lights, lamps, electric sockets, door locks and sash windows are all working. Underneath in the drawers are two power packs providing power to run the lights. Most of the furniture has the date of completion written underneath it. Dimensions: 1150mm wide x 1250 mm high x 500 deep. Miniature homes, furnished with domestic articles and resident inhabitants (both people and animals), have been made for thousands of years. The earliest known examples were found in the Egyptian Tombs of the Old Kingdom, created nearly five thousand years ago. These wooden models of servants, furnishings, boats, livestock and pets placed in the Pyramids almost certainly were made for religious purposes. The earliest known European dollhouses are from the sixteenth century. These baby or cabinet houses showed idealized interiors complete with extremely detailed furnishings and accessories (mostly hand made). The early European dollhouses were each unique, constructed on a custom basis by individual craftsmen. With the advent of the Industrial Revolution, factories began mass producing toys, including dollhouses and miniatures suitable for furnishing them. German companies noted for their dollhouses included Christian Hacker, Moritz Gottschalk, Elastolin, and Moritz Reichel. The list of important English companies includes Siber & Fleming, Evans & Cartwright, and Lines Brothers (which became Tri-ang). By the end of the nineteenth century American dollhouses were being made in the United States by The Bliss Manufacturing Company. Germany was the producer of the most prized dollhouses and doll house miniatures up until The Great War. Notable German miniature companies included Marklin, Rock and Garner and others. Their products were not only avidly collected in Central Europe, but regularly exported to Britain and North America. Germany’s involvement in WWI seriously impeded both production and export. New manufacturers in other countries arose. The Toy Furniture Shop of Providence, Rhode Island (The TynieToy Company) made authentic replicas of American antique houses and furniture in a uniform scale beginning in about 1917. Other American companies of the early twentieth century were Roger Williams Toys, Tootsietoy, Schoenhut, and the Wisconsin Toy Co. Dollhouse dolls and miniatures were also produced in Japan, mostly by copying original German designs. After World War Two dollhouses became mass produced in factories on a much larger scale, and with less detailed craftsmanship, than ever before. By the 1950′s the typical dollhouse sold commercially was painted sheet metal filled with plastic furniture. The cost of these houses was low enough to allow the great majority of girls from the developed western countries that were not struggling with rebuilding after WWII to own a dollhouse. Several magnificent antique dollhouses are on exhibit in Museums around the world. Although these houses were not constructed to capture an era, activities of daily living are shown in such great detail in some of them that the viewer gains some insight into domestic life of the times. Dutch – The Doll’s House of Petronella Oortman c. 1686-1705. The Rijksmuseum Amsterdam estimates that P. Oortman spent twenty to thirty thousand guilders on her “model house”, the price of a real house along one of Amsterdam’s canals at that time. This doll’s house shows the linen room (laundry room), kitchen, and bedrooms in great detail – which serve to illustrate the workings of the household of that era. English-The Tate House (1760), on Exhibit in The Museum of Childhood in London. The baby houses of the seventeenth and eighteenth centuries, and the toy dollhouses of the nineteenth and early twentieth century rarely had uniform scales, even for the features or contents of any one individual house. Although a number of manufacturers made lines of miniature toy furniture in the nineteenth century, these products were not to a strict scale. 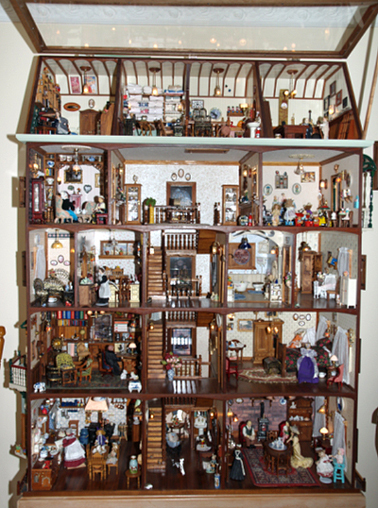 There have been several standard scales in dollhouses over the years. Children’s toy houses during most of the 20th century were three quarter Houses were made from a variety of materials, including metal (tin litho), fibreboard, plastic, and wood. In Germany during the middle part of the 20th century 1/10th scale became popular (based on a metric system where 10 inches is represented by 1 inch). Toylike houses coming out of Germany today remain closer in scale to 1:10 than to 1:12. In the 1970s, the standard for adult collectors became 1/12th. There is also half inch scale or 1/24th, quarter inch scale or 1/48th, and “dollhouse for a dollhouse” (1:144). Half-inch scale was popular in Marx dollhouses in the 1950s but only became widely available in “collector” houses after 2002, about the same time that even smaller scales became more popular. These smaller scales are much more common in the U.S. than in Britain. Frans and Christina Bosdyk married in the Hague, Netherlands where Frans worked as an electronic instrument maker for quality control test equipment in the manufacturing industry. Initially trained as an electrical and mechanical engineer, his expertise developed into skills that were mostly self taught. He was an expert on clockwork mechanisms and was able to make the finest instruments in metal or wood. The last job he had there was setting up a system for a factory of 1200 people. They came to Australia in 1962 on a Convair plane as assisted immigrants. At first he worked at the Electrical Equipment of Australia laboratory that tested electrical equipment for the Navy. Frans made the first dollhouse for his daughter 35 years ago and has also turned his hand to working miniature electric cars, trucks, cranes and forklifts operated by remote control. Work on the dollhouse took Christina and Frans 8 years from 1997 to 2006, 15,000 hours and $9,000 worth of materials. The style of the house is based on a 1850-1950 house with Dutch and Australian influences to a scale of 1:10-1:12. Frans did research from the publication Antique furniture in Australia by Anthony Hill for design ideas for his furniture but added his own touch and used silky oak, cedar, and blackwood. Frans made most of the furniture and house exterior and interior fittings including all the wooden picture frames. Turned legs were made with elegant tools he made himself from concrete nails and lathes of every conceivable size. He made working miniatures of coffee grinders, clocks, scissors, cheese graters etc. While Frans worked on the furniture and structure, Christina focussed on sourcing miniature items and dolls. She visited doll shows at Bankstown and purchased from a miniature shop in Moss Vale. Wallpaper was sourced from hardware and hobby shops. The process was documented with 800 photos including patterns and designs for items of furniture. Frans has been on TV in Better Homes and Gardens four times. The dollhouse has historic significance as evidence of post World War Two refugee migration to Australia and the traumatic experience of dislocation and separation from family. The object served as a tangible link to the culture and traditions of the Netherlands. The dollhouse has aesthetic significance in the design and manufacture of Dutch dollhouses and their distinctiveness from those from other countries. The dollhouse provides a research tool for historians to explore post World War Two migration stories from the Netherlands and the development of Dutch dollhouse production and design. The dollhouse’s provenance is strong. This dollhouse was made by Frans and Christina Bosdyk between 1997 and 2006. It was acquired by the Powerhouse Museum in 2007. The dollhouse represents the culture and traditions the Netherlands and the experience of post World War 2 refugee migration to Australia. The dollhouse’s importance lies in its potential to interpret Dutch dollhouse making and design. The dollhouse also has the potential to interpret post World War Two migration to Australia, social dislocation of refugees and the importance of folk craft in Dutch culture.